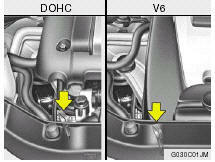 Engine oil is essential to the performance and service of the engine. It is suggested that you check the oil level at least once a week in normal use and more often if you are on a trip or driving in severe conditions. NOTE: o For good fuel economy, SAE 5W-20 (5W- 30), ILSAC GF-3 engine oil is preferred regardless of regional option and engine variation. o If SAE 5W-20, ILSAC GF-3 engine oil is not available, secondary recommended engine oil for corresponding temperature range can be used. Before checking the oil, warm up the engine to the normal operating temperature and be sure your car is parked on level ground. Turn the engine off. Wait five minutes , then remove the dipstick, wipe it off, fully reinsert the dipstick and withdraw it again. Then note the highest level the oil has reached on the dipstick. It should be between the upper ("FULL") and lower ("LOW") range. WARNING: Be very careful not to touch the radiator hose when checking the engine oil as it may be hot enough to burn you. If the oil level is close to or below the "L" mark, add oil until it reaches the "F" mark. To add oil: 1. Remove the oil filler cap by turning it counterclockwise. 2. Add oil, then check the level again. Do not overfill. 3. Replace the cap by turning it clockwise. The distance between the "F" and "L" marks is equal to about 1 quart of oil. WARNING: Be very careful not to touch the radiator hose when adding the engine oil as it may be hot enough to burn you.